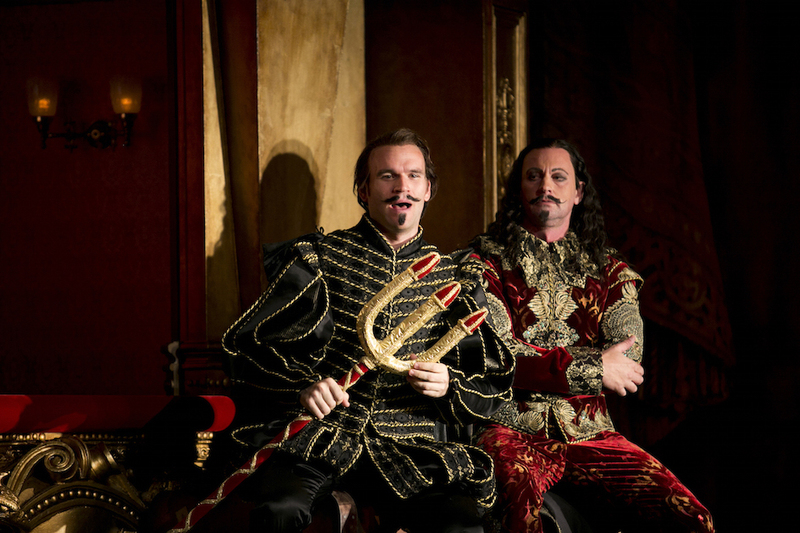 The strength of the cast and the scale of the production are all the more appreciated given that the season could have almost rested on the attraction of visiting American tenor Michael Fabiano. Well known to viewers of the Met Opera Live in HD series after his appearance in landmark opera documentary The Audition, Fabiano is on the cusp of being one of the world’s most sought after tenors. Blessed with a thrilling ring to his powerful tenor voice, Fabiano is also a superb actor and a magnetic stage presence. The reaction of the audience to his first appearance from under the aged make-up was audible, and appreciation only rose from there. In Faust’s big aria “Salut! 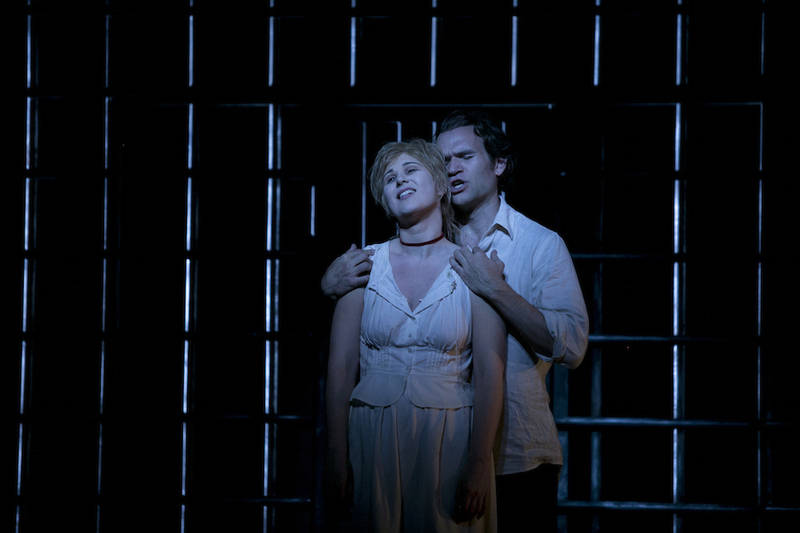 Demeure chaste et pure” Fabiano demonstrated the soaring power of his voice, which can also hush to a whisper as required. 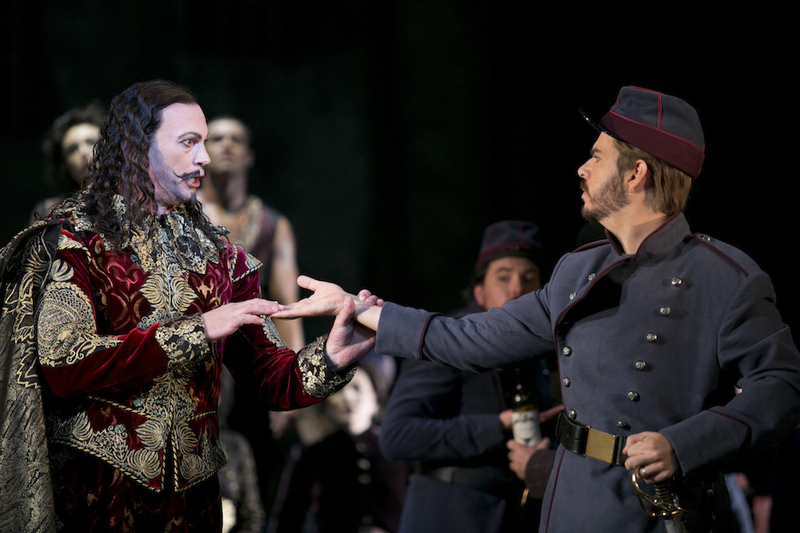 Fabiano charts the journey of Faust from painfully shuffling elder to bright-eyed, reinvigorated youth to desperate, drug-addled degenerate with pinpoint accuracy, garnering full audience sympathy and affection despite the fact that Faust is essentially a selfish, greedy man. Charles Edwards’ spectacular, large-scale designs bring to mind the new staging of Les Misérables, so it must be noted that this production was designed first (2004 for Royal Opera et al). After a magical transition between the first two acts, from Faust’s chambers to the densely populated streets, it is a little disappointing that the remaining changes are covered with the house curtain. The sets are rich, extensive and highly attractive, completed to a very high standard of polish. 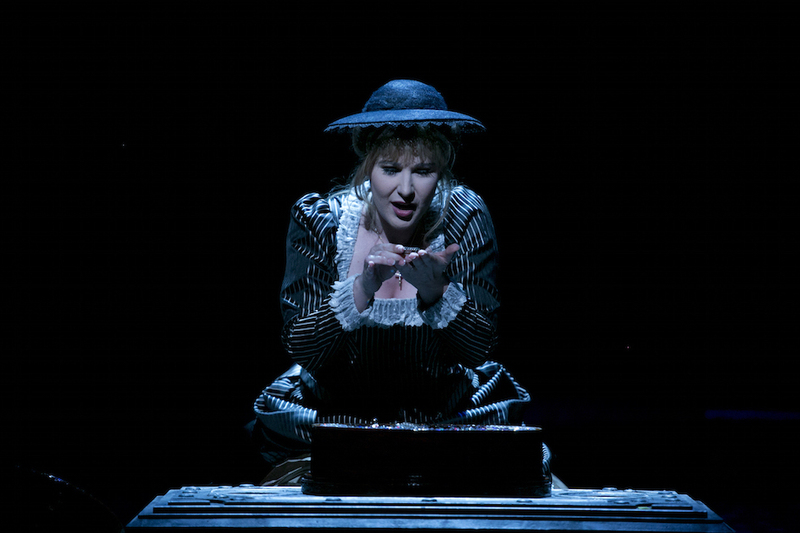 The dark and glossy costume design, by Brigitte Reiffenstuel, is as sumptuous and satisfying as the scenic design. Witty touches abound for the devilish Méphistophélès, who cheekily inserts himself into whatever is playing in each scene. As Méphistophélès, popular bass baritone Teddy Tahu Rhodes does not quite produce the rumbling malevolence of Russian bass Barseg Tunyaman (so memorable in the wonderful VSO Faust of the 1990s) but has a charismatic presence that is appreciated by the audience. Rhodes more than holds his own in duets with Fabiano. Chorus singing is reliably excellent, with a special immersive treat coming in the final glorious moments of the opera. 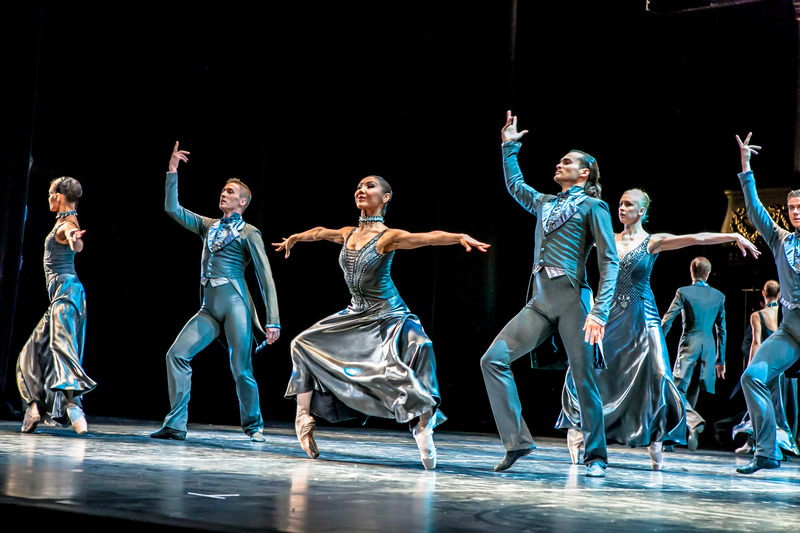 The use of multiple actors and dancers add significantly to the visual pageantry. 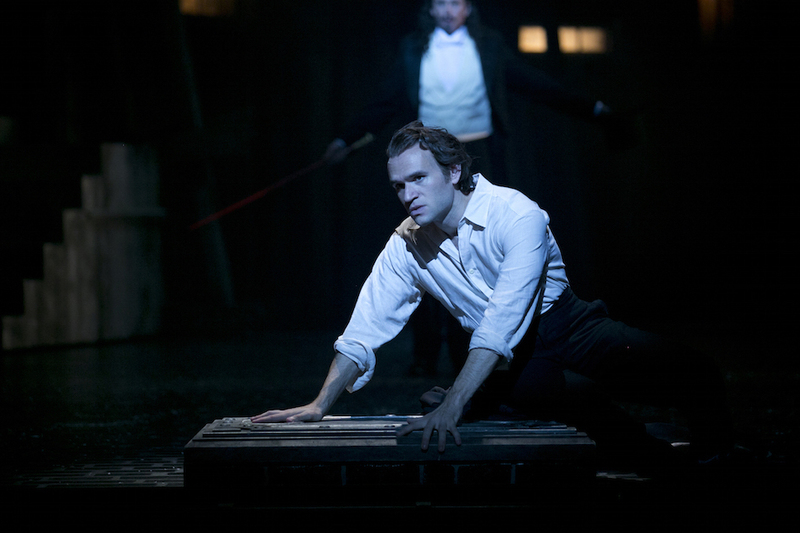 Faust was reviewed 12pm Saturday 28 February 2015. 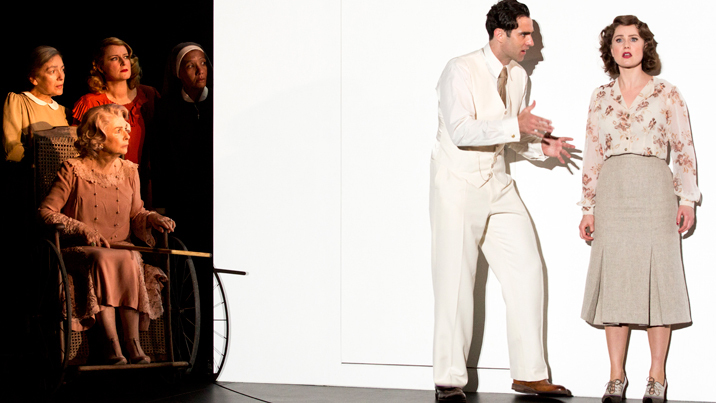 Faust plays selected dates at Joan Sutherland Theatre, Sydney Opera House until 13 March 2015. Man in Chair also reviewed Michael Fabiano in Verdi’s I Lombardi in concert in New York. A year ago my wife and I spent three days in Sydney at the end of a cruise last year and were very disappointed that there were no operas on stage. We find ourselves back this year at the end of another and, on land, have found ourselves in a sea of music. Last night’s Faust was our first (of three) performances at the Joan Sutherland Theater and it was simply thrilling to be there. We will be there for tonight’s Butterfly and tomorrow’s Tosca as well. Combined with Sydney Symphony performance a couple of weeks ago and anticipating the Australian String Quartet on Saturday, we will fly back to Boston on Tuesday with music in our memories of Sydney and Australia. I would depart from the review above only as it concerns Giorgio Caoduro. His Valentin was a huge disappointment. Perhaps he just had a bad night or was ill but his voice was not strong, not secure, and not melodious in one of the opera’s loveliest arias. And one more quibble…I can’t say that I’ve ever seen an opera where the conductor has three spotlights on him (or her) throughout the performance. Perhaps as he/she ascends the podium, yes, but it seemed completely out of place. It was as if he were one of the dancers instead of the person responsible for creating something on stage and beyond his ego. Thanks so much for your comments Jim. 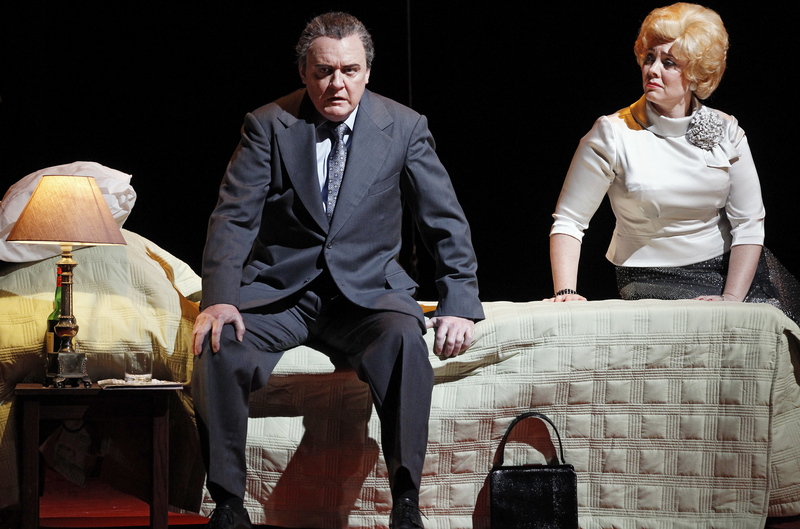 You and your wife have hit the jackpot this time, with three operas to see at SOH! As with Faust, I think you will see every dollar of your ticket price on stage in Tosca as it is a truly lavish production. The highly artistic Butterfly production has been on stage for several years here and never fails to charm. I was very happy with Caoduro on Saturday afternoon, so perhaps you are right that he was out of sorts last night. He has pressed here in Lucia di Lammermoor and Rigoletto. I didn’t notice all the lights on the podium on Saturday, but the conductor last night was doing his first Faust of this season so maybe he needed extra light for some reason. It does sound distracting so I wonder what they were thinking there. Enjoy your visit, and I hope I will find such a strong week of music when I visit Boston at some time in the future.